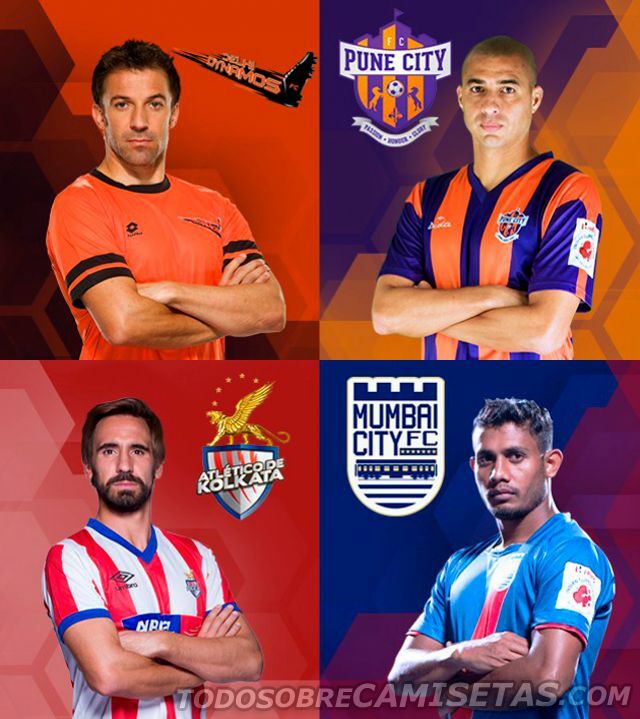 Indian Super League is the recently created football professional league in India, having eight franchise teams (just like the MLS) in it’s first edition and will endure for three months. 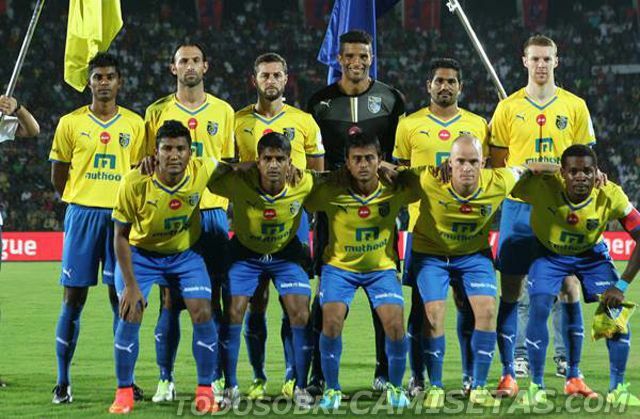 The first half of the year sees the I-League taking place from January to May, with ten teams in competition. 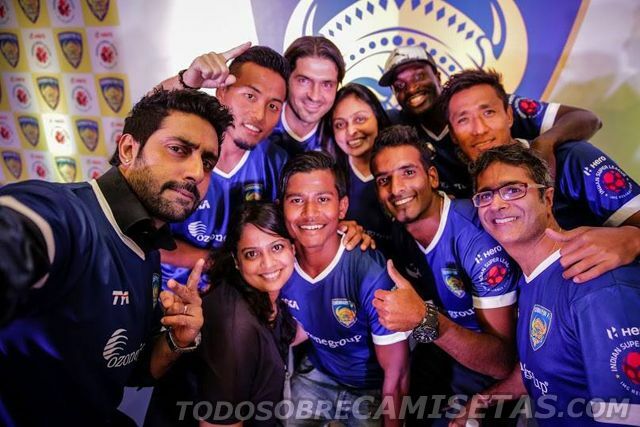 ISL aims to boost football in that country, making and spending lots of money. It seems to be successfull (as for now), dragging great attendance numbers for each match, even if they play in working days, creating a solid base of fanatics. Going back to our element, shirts, we’ll take a look to this year’s team gear, putting them all together for this being their first year ever. Partially owned by Atlético de Madrid, is the club at the top of the league in an unbeaten run. 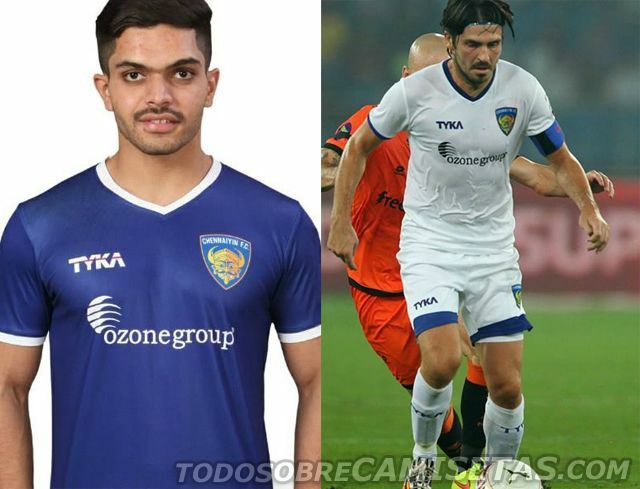 Their marquee player is Luis García and their technical sponsor is Umbro. 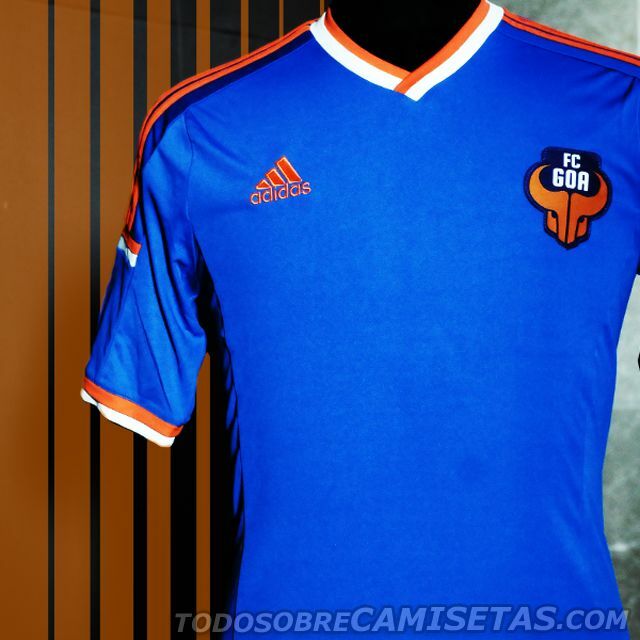 Their home kit pays a clear homage to the spanish club, using vertical red/white stripes combined with blue details. Away kit combines white and gray in a interesting design with curved vertical stripes that run to the sides. 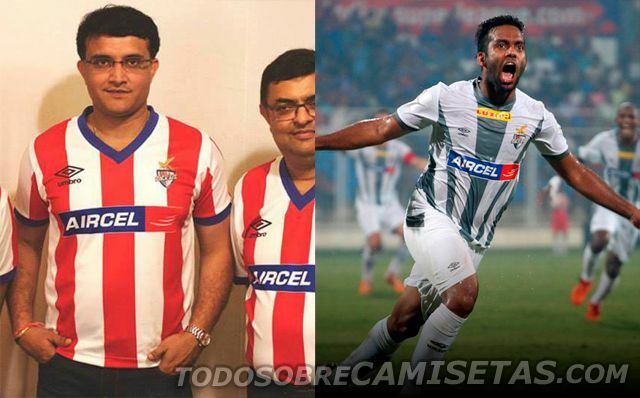 Both principal sponsors appear in boxes on the front of the jersey, somehow damaging he visual style of the shirts. 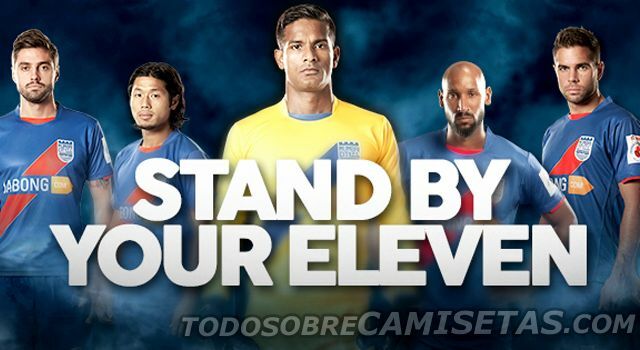 Their marquee player is Elano, current top scorer with 7 goals in his behalf. 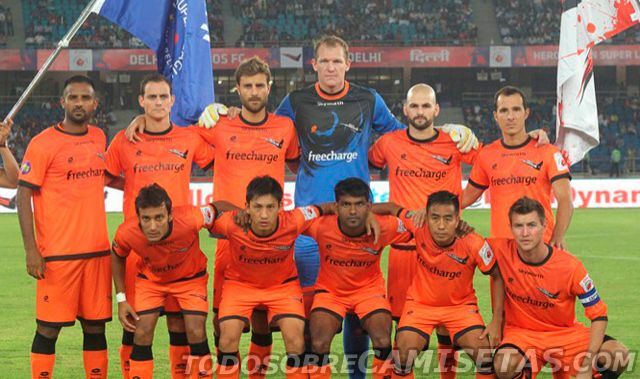 They are in the second position, just two points behind Atlético de Kolkata, and are one of the strongest tittle aspirants. They are sponsored by TYKA, and almost unknown brand that offers a simple work, that just puts some white in a V neck and cuffs on a plain uniform, mainly blue for home matches and white for the away ones. Their main sponsor is Ozone Group, whose simple logo goes pretty well with the design. The club that counts with italian player Alessandro Del Piero is in the sixth place, with just one victory, three draws and two defeats. Their technical sponsor is Lotto, though the shirt design is really curious for their unusual details that we have not seen in this year work from the italian brand. 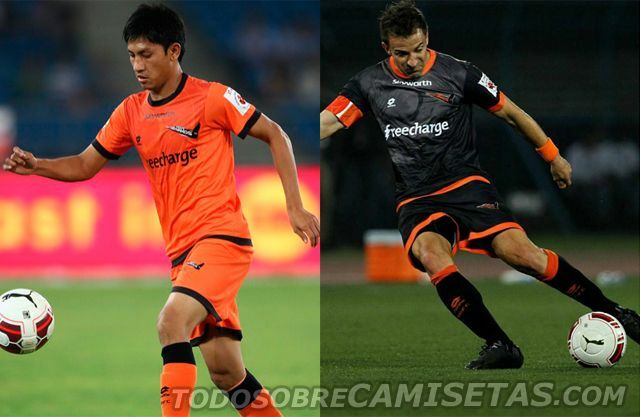 The design itself is pretty simple, with round collar and details on the sleeves, combining orange with black in the home kit, reversing the colors for the away uniform. Lotto’s logo is different than usual and does not appear on the sleeves. Both jerseys have an interesting watermark pattern on the chest zone. The club managed by the legendary Zico is in the bottom of the table with just 4 points in 5 games. 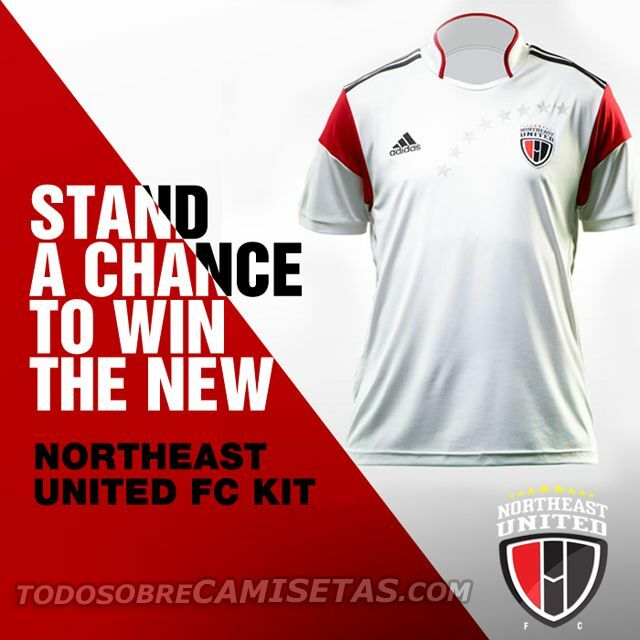 They’re one of he two clubs sponsored by Adidas, and one of the three that has not unveiled an away kit. Their jersey uses the Condivo 14 template, using blue as base color and white/orange for the details on neck, shoulders and sleeves. Numerous sponsors organized in boxes appear all over the shirt worn by the players leaded by ex-Arsenal player Robert Pirès. 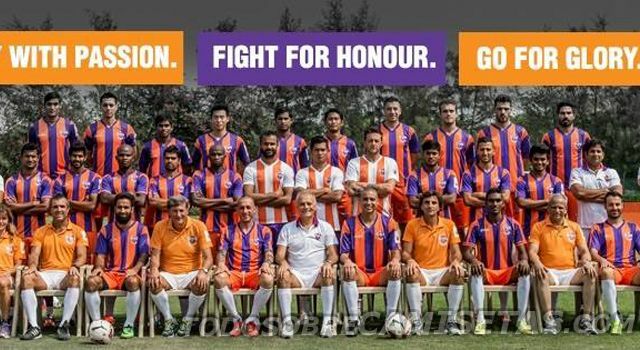 Currently in the 5th place, this club is owned by the actor Hrithik Roshan, Wadhawan Group and AFC Fiorentina (maybe the reason for the purple in their uniforms). Their kits are made by Dida (no, not the brazilian goalkeeper) and show a pretty simple work, that changes the design for eah shirt. 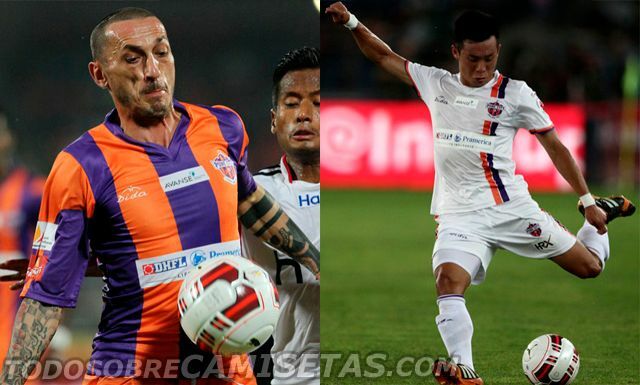 Home jersey has vertical purple/orange stripes, while the away has white base with a double vertical band on the left combining the home colors, going under the club’s crest. Their marquee player is the french striker David Trezeguet. 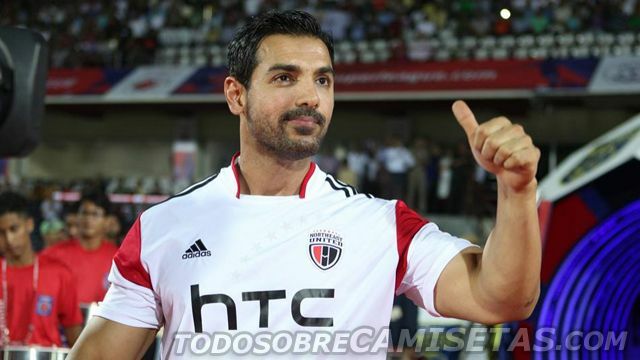 David James, recently declared in bankrupcy, is the goalkeeper-manager and marquee player for this team located in Kochi. Before the start of the competition the team worn a generic brandless yellow uniform, but for their first official match used a Puma jersey that uses one of the current templates from the brand with the cat, adding some blue to the neck and the sleeves. An elephant watermark appears on the lower right side of the shirt. They’ve not unveiled any away jerseys, so we’ll have to wait until we can see it. 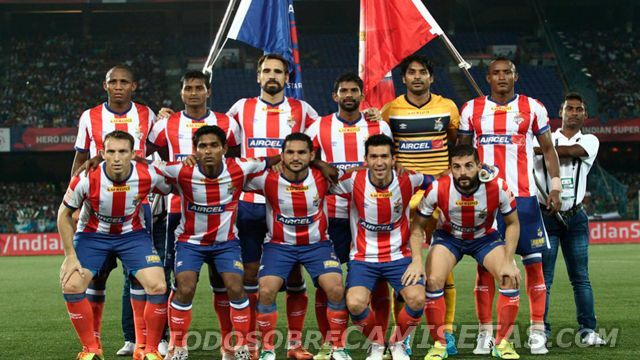 The team managed by english coach Peter Reid played te first league match against Atlético de Kolkata, enduring a three goal defeat. They’re the only club without an official technical sponsor putting it’s logo on their shirts, consisting of a plain base with a diagonal band cutted by the crest and the main front sponsor. 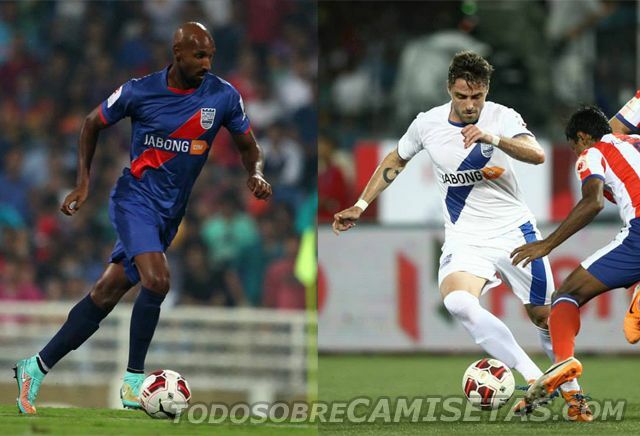 Home jersey combines blue with red/white, while the away shows some blue on white base. Their marquee player is the former Chelsea striker Nicolas Anelka. The second Adidas sponsored club is currently in the 4th position of the league. Leaded by spaniard Joan Capdevilla, they’ll fight to earn a place in the semifinals to play for the first league title. 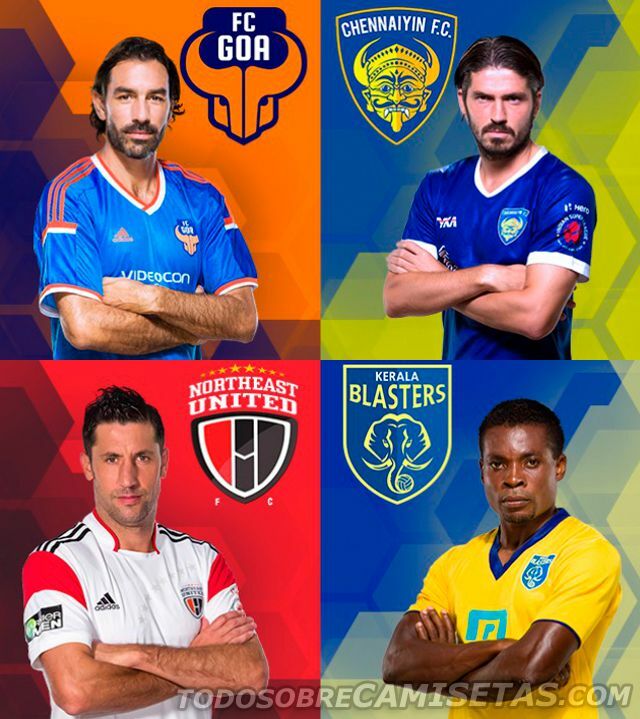 Just like Kerala Blasters and FC Goa they’ve just used one uniform, with white as main color. The tempalte used is not usual in the german brand, with high neck and a red zone interrupting the three black stripes on the shoulders. 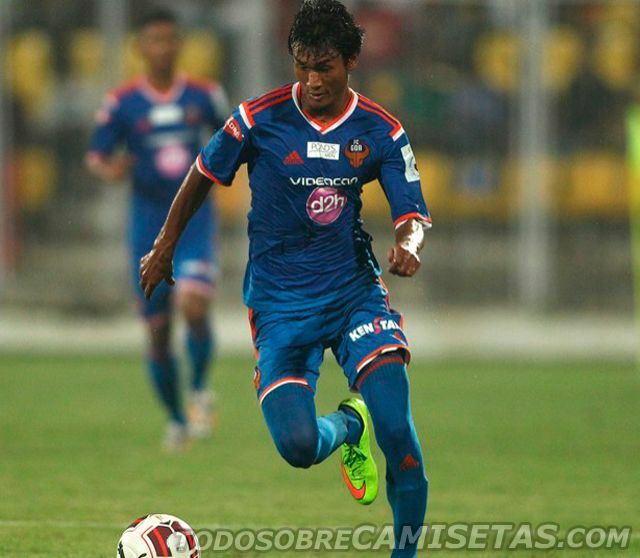 8 stars representing the eight states of India (Assam, Nagaland, Manipur, Meghalaya, Sikkim, Arunachal Pradesh, Tripura and Mizoram) appear as watermark on the chest of the jersey.